Please Click On The Above Video To View the Benefits Of The Hub City Hera Gear Box. • Power Ratings available up to 27 H.P. 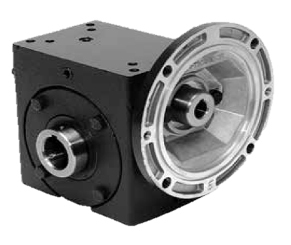 • With Rolling action gearing (Helical and Hypoid) – significant wear particle reduction & increased power density. • Viton seals provide enhanced protection at higher operating temperatures. • USDA H1 lube available. • Higher efficiency provides lower operating temperature and increased seal life. • The Hub City HubLoc® bushings are versatile, robust, easily installed, and create a keyless, backlash-free mechanical interference fit that eliminates the micromovement that causes fretting and cold welding. 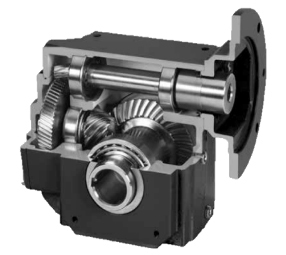 • Gearboxes are available in a wide range of standard bore sizes. • Tamper Resistant HubCap™ protective covers (Patent Pending) are made from metal-detectable plastic to support customer HACCP programs. 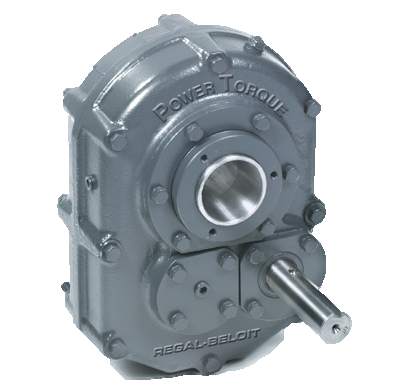 Hub City’s PowerTorque® Shaft Mount Reducers are available in power ratings up to 200 HP and ratios from 9:1 through 25:1 depending on model. Efficiency is 98.5%. Universal mounting dimensions assure maximum design flexibility. High Strength Ductile Iron Housings provide maximum durability. High Efficiency AGMA Class 11 helical gearing is case carburized and ground. Cast Iron Housings designed to last, superior thermal conductivity. Hardened and ground worm and alloy bronze gear for greater life. Available as solid shaft output on the left, right, or double output or “hollow shaft”/ “shaft mount”.